Kathmandu is the main gateway to Nepal’s numerous wonders and UNESCO World Heritage Sites. When there comes a time that you need to find a comfortable respite during your vacation to this part of the world, look no further because below are the best hostels and hotels in Kathmandu to suit your fancy. Now, it helps to note that traveling to Nepal is quite cheap so you will find that even the most luxurious places can have such reasonable prices — so, you’re in for quite a treat! Activities to do in Kathmandu? This hostel may be in the heart of Thamel but it is still conveniently tucked away from the hustle and bustle of the city! It’s a great way to relax after a long tiring day in the city and it has all the amenities you’ll need. Also smacked in the center of Thamel, Trekkers’ Home makes for a comfortable accommodation for those who have a low budget. The rooms here total to 40 with choices of single, double, triple and family suites. This is an extremely good for value hotel for the price given that it’s not only well-located but also well-furnished too! All rooms have air conditioning, FREE Wifi and basic complimentary items. This is a simple yet elegant hotel with a spacious garden and terrace; plus, the UNESCO site of Kathmandu’s Durbar Square is just 1.5km away so it makes for a great base in the city. (Rooms are also modern with air conditioning). This has got to be the best budget hotel in Kathmandu! Location and price aside, the whole of the property is decorated in modern furnishings and the rooms even provide mountain views. What more could you ask for? This is a new bed and breakfast that has a great barbecue and sun terrace, apart from the quaint restaurant that offers an array of cuisines. All rooms even have access to the common balcony so that’s an added plus! I loved staying in this hotel as it offers a quiet oasis near bustling Thamel! If you’re looking to be in an accommodation that exudes a luxurious Nepalese charm, then you should be staying here! (The rooftop garden is also great for city views). 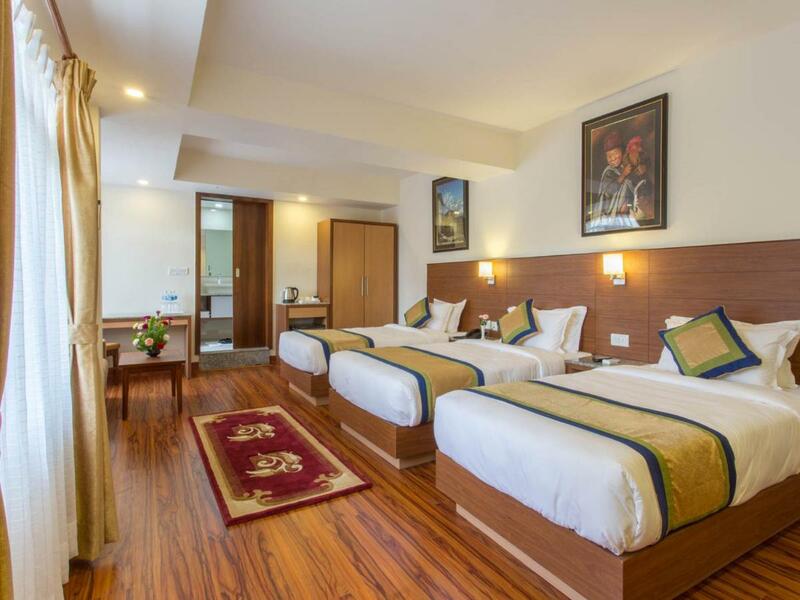 This is a new hotel with rooms that offer great views over the Kathmandu cityscape. The staff offers 5-star service, and you’ll be assured of great food in the in house restaurant and bar. Much like Kantipur Temple House, this is a beautiful traditional heritage hotel in Kathmandu that has quality services and amenities. Guests will particularly love the spacious rooms, terrace and courtyard. This may be another traditionally-styled hotel but it has all the amenities and extras that a modern hotel could have. Comfortable yet splashed with a tinge of lux, this is truly one of the best hotels in Kathmandu. Spread over 12 acres of charming gardens, this hotel has a great outdoor pool, restaurant (offering international cuisines), and barbecue area. It’s clad in elegant decor that perfectly exudes luxury Nepalese elements. This is a beautiful heritage hotel palace that is surrounded by antique fountains and landscaped gardens. You will definitely feel like royalty by checking in here! (The property also features a casino, an outdoor pool and 2 tennis courts). Much like how Hyatt hotels go, this Kathmandu hotel offers luxurious indulgences through its modern rooms, picturesque gardens, massage center, outdoor pool and well-appointed amenities. Situated inside the serene Gokarna Protected Forest, this is a great respite in the outskirts of Kathmandu city. It offers extra amenities such as an 18-hole golf course, a spa, a health club as well as 4 dining options. Featuring an extensive collection of artefacts from the 13th century, Dwarika’s Hotel is modelled after the palaces of Newar Kings — so it’s no wonder that it won the PATA Heritage Award. (It features an impressive outdoor pool and 4 dining options). I hope this article helped save you the time and effort when looking for the best places to stay in Kathmandu. What other hotels or hostels in Kathmandu can you recommend?? I cannot make up my mind on which luxurious hotel and room I would like to stay at if I ever had the chance. I would love to venture into the mountains and hike along some of their beautiful waterfalls. You're sure to have lots of choices then for that ;) but then yeah, choosing may be tough — but the top 5 above will not disappoint you! This is an amazing blog Ms. Aileen. They’re always insightful and full of valuable content. I haven't started traveling not even last summer, and I’m not sure how it took this long… but I recently found your blog, and I’m loving the content. This list of hotels located in Kathmandu, Nepal will be several more travel related blogs to mull over. It makes feel like I was on a tour and that I was there. The photo itself explained a lot. It's mesmerizing. I can imagine myself lying on their nice beds inside that well organized room. The ambiance is perfect. Wishin' to be there and witness it's picture perfect hotels. I think that Kantipur Temple House would be a place I would enjoy staying. Either that or Gokarna Forest Resort because I LOVE the forrest! All of them look rather nice for different reasons! The Kantipur Temple House looks just my style! The architecture is so beautiful and unique. I would love to sit in the rooftop garden at the end of a busy day and just take in the city! Indeed, I loved my stay here a lot!